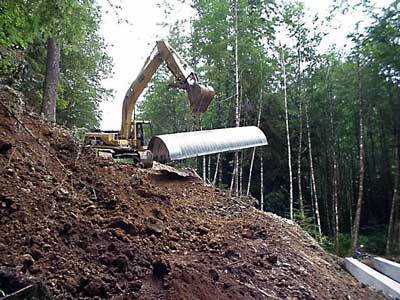 The installation of culverts in fish-bearing waters is primarily regulated by the State of Alaska under the authorities found in AS 16.05 and at the federal level principally by the U.S. Army Corps of Engineers (COE). The Section 10 and Section 404 Regulatory Programs are the principal federal regulatory programs, implemented by the COE, affecting structures, work, and the discharge of dredged and/or fill material in Navigable and other Waters of the U.S., including wetlands. (the limits vary between tidal and non-tidal, and between Section 10 and Section 404). COE regulatory jurisdiction is depicted in a landscape view of the regulatory jurisdiction boundaries, as well as definitions and schematic views of different water lines and elevations (reference the Jurisdiction Diagram). It is important to understand the difference between COE jurisdiction under Section 10 of the Rivers and Harbors Act and Section 404 of the Clean Water Act. To clarify, Section 10 applies to structures and work in Navigable Waters, while Section 404 applies to the discharge of dredged and/or fill material into all Waters of the U.S., including wetlands. Waters of the U.S. (under Section 404) includes all Navigable Waters as identified under Section 10 of the Rivers and Harbors Act. Pursuant to Section 10 of the Rivers and Harbors Act of 1899, the COE regulates all structures and work in, or affecting, navigable waters of the U.S. (Rivers and Harbors Act, Section 10). Corps of Engineers authorization is required for all structures and work in Navigable Waters of the U.S. including the installation or replacement of culverts. In tidal waters, this applies to work and structures below the Mean High Water line. In fresh waters (i.e., non-tidal), COE jurisdiction applies to work and structures below the line of Ordinary High Water. However, because of the fill material necessary for installation or replacement off a culvert, in tidal waters, the line of Mean High Water is irrelevant since it lies below High Tide Line (reference the Jurisdiction Diagram). "waters such as intrastate lakes, rivers, streams (including intermittent streams), mudflats, sandflats, wetlands, sloughs, prairie potholes, wet meadows, playa lakes, or natural ponds, the use, degradation, or destruction of which could affect interstate or foreign commerce." By adopting such a broad definition of "waters of the U.S.," virtually all wetlands were afforded federal protection under Section 404. The Secretary of the Army, acting through the COE, was directed to administer Section 404 (Section 404) in the Clean Water Act (CWA). This statute authorizes the Secretary of the Army, acting through the Chief of Engineers, to issue permits, after notice and opportunity for a public hearing, for the discharge of dredged or fill material into the waters of the United States. This authority covers a wide range of activities, from constructing bridges and culverts to improving fish habitat. A complete description of COE authority to issue permits is described in 33 CFR 320.2, which also includes the types of regulated activities listed in 33 CFR 320.1(b) (33 CFR Part 320 - General Regulatory Policies). For the installation or replacement of culverts, COE authorization, under Section 404 of the Clean Water Act, would be required for the discharge of fill material in Waters of the U.S. (navigable or otherwise), including wetlands. In tidal waters this would apply to fill placed below High Tide Line or within the limits of adjacent wetlands. In fresh waters (i.e., non-tidal), deemed navigable, this would apply to fill placed below the Ordinary High Water line or within the limits of adjacent wetlands. Activities that result in the discharge of dredged or fill material into the waters of the United States require a written authorization (permit) from the COE. A description of the discharges that require permits, as well as those that do not, can be found in 33 CFR 323 (33 CFR 323). The COE, in reviewing Section 404 permit applications, requires avoidance of impacts and minimization of unavoidable impacts. The mitigation of unavoidable impacts (compensatory mitigation) is often required in some local jurisdictions such as Anchorage, Juneau, or Fairbanks). In addition, a Water Quality Certification (or Waiver thereof) pursuant to Section 401 of the CWA is required for Section 404 permit actions. The review of COE permit applications also considers the requirements of the National Environmental Policy Act (NEPA), as well as EPA's Section 404(b)(1) Guidelines. However, the 404(b)(1) Guidelines (40 CFR, Part 230) are the substantive criteria used in evaluating discharges or dredged of fill material under section 404. Section 404(b)(1) Guidelines (Section 404(b)(1)) describe the environmental criteria used in evaluating the discharges of dredged or fill material in the waters of the United States under Section 404 of the Clean Water Act and are applicable to all 404 permit decisions. The purpose of these Guidelines is to restore and maintain the chemical, physical, and biological integrity of United States waters through the control of discharges of dredged or fill material. Fundamental to the Guidelines is an understanding that dredge or fill material should not be discharged into such waters unless it is demonstrated that such discharges would not have unacceptable adverse impacts either individually or in combination with existing and/or probable impacts of other activities affecting the environment. The following hyperlink provides background information on the COE regulatory program in Alaska, defines the appropriate statutes, provides permit applications, and reviews other permit evaluation issues (Regulatory Program). Disclaimer: The following information is not the official version of the Alaska statutes and regulations. They are intended as an informational guide only. Every effort has been made to ensure their accuracy, but this cannot be guaranteed. The State of Alaska makes no warranty, express of implied, as to the accuracy of the information. If it is critical that the precise language of the Alaska Statutes and regulations be known, please refer to the official printed version. If any errors are found, please notify us via e-mail. The Fishway Act requires that an individual or governmental agency notify and obtain authorization from the Alaska Department of Fish and Game, Division of Habitat (Habitat) for activities within or across a stream used by fish if the department determines that such uses or activities could represent an impediment to the efficient passage of fish. If the commissioner considers it necessary, every dam or other obstruction built by any person across a stream frequented by salmon or other fish shall be provided by that person with a durable and efficient fishway and a device for efficient passage for downstream migrants. The fishway or device or both shall be maintained in a practical and effective manner in the place, form, and capacity the commissioner approves, for which plans and specifications shall be approved by the commissioner upon application to it. The fishway or device shall be kept open, unobstructed, and supplied with a sufficient quantity of water to admit freely the passage of fish through it. enter into an agreement with the commissioner, secured by good and sufficient bond, to pay to the fish and game fund the initial amount of money and annual payments thereafter that the commissioner of fish and game considers necessary to expand, maintain, and operate additional facilities at existing hatcheries within a reasonable distance of the dam or obstruction. The owner of a dam or obstruction who fails to comply with AS 16.05.841 or 16.05.851 or a regulation adopted under AS 16.05.841 or 16.05.851 within a reasonable time specified by written notice from the commissioner is guilty of a misdemeanor, and is punishable by a fine of not more than $1,000. Each day the owner fails to comply constitutes a separate offense. In addition to the fine, the dam or other obstruction managed, controlled, or owned by a person violating AS 16.05.841 or 16.05.851 or a regulation adopted under AS 16.05.841 or 16.05.851 is a public nuisance and is subject to abatement. The Anadromous Fish Act requires that an individual or governmental agency provide prior notification and obtain approval from the Alaska Department of Fish and Game, Division of Habitat (Habitat) "to construct a hydraulic project or use, divert, obstruct, pollute, or change the natural flow or bed" of a specified anadromous waterbody or "to use wheeled, tracked, or excavating equipment or log-dragging equipment in the bed" of a specified anadromous waterbody. All activities within or across a specified anadromous waterbody and all instream activities affecting a specified anadromous waterbody require approval. The commissioner shall, in accordance with AS 44.62 (Administrative Procedure Act), specify the various rivers, lakes, and streams or parts of them that are important for the spawning, rearing, or migration of anadromous fish. If a person or governmental agency desires to construct a hydraulic project, or use, divert, obstruct, pollute, or change the natural flow or bed of a specified river, lake, or stream, or to use wheeled, tracked, or excavating equipment or log-dragging equipment in the bed of a specified river, lake, or stream, the person or governmental agency shall notify the commissioner of this intention before the beginning of the construction or use. the approximate date the construction, work, or use will begin. The commissioner shall approve the proposed construction, work, or use in writing unless the commissioner finds the plans and specifications insufficient for the proper protection of fish and game. Upon a finding that the plans and specifications are insufficient for the proper protection of fish and game, the commissioner shall notify the person or governmental agency that submitted the plans and specifications of that finding by first class mail. The person or governmental agency may, within 90 days of receiving the notice, initiate a hearing under AS 44.62.370 . The hearing is subject to AS 44.62.330 - AS 44.62.630. If a person or governmental agency begins construction on a work or project or use for which notice is required by AS 16.05.871 without first providing plans and specifications subject to the approval of the commissioner for the proper protection of fish and game, and without first having obtained written approval of the commissioner as to the adequacy of the plans and specifications submitted for the protection of fish and game, the person or agency is guilty of a misdemeanor. If a person or governmental agency is convicted of violating AS 16.05.871 - 16.05.896 or continues a use, work or project without fully complying with AS 16.05.871 - 16.05.896, the use, work, or project is a public nuisance and is subject to abatement. The cost of restoring a specified river, lake, or stream to its original condition shall be borne by the violator and shall be in addition to the penalty imposed by the court. In an emergency arising from weather or stream flow conditions, the commissioner, through its authorized representatives, shall issue oral permits to a riparian owner for removing obstructions or for repairing existing structures without the necessity of submitting prepared plans and specifications as required by AS 16.05.871. If a person or governmental agency fails to notify the commissioner of any construction or use that causes material damage to the spawning beds or prevents or interferes with the migration of anadromous fish, or by neglect or noncompliance with plans and specifications required and approved by the commissioner causes material damage to the spawning beds or prevents or interferes with the migration of anadromous fish, the person or governmental agency shall be guilty of a misdemeanor. A person who violates AS 16.05.871 - 16.05.896 is guilty of a class A misdemeanor. The court shall transmit the proceeds of all fines to the proper state officer for deposit in the general fund of the state. If you would like more information concerning Fish Passage, please contact Gillian O'Doherty, Habitat Biologist, Alaska Department of Fish and Game.